They're no "Avengers." 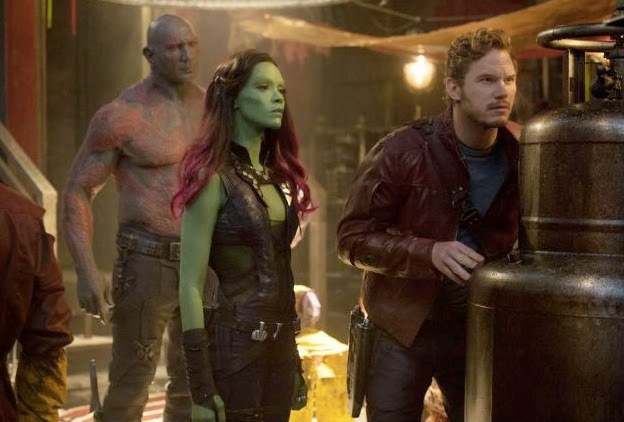 Dave Bautista, Zoe Saldana and Chris Pratt are three members of "The Guardians of the Galaxy." "Guardians of the Galaxy" is the movie that non-fans of "Buffy the Vampire Slayer" worried "The Avengers" would turn out to be when Joss Whedon was tapped to direct that 2012 Marvel super-team outing. While Whedon managed to rein in his fondness for ironic camp and deadpan snark to deliver a blockbuster that was fun without being irritatingly insincere, "Guardians" director/co-writer James Gunn seems to delight in making this silly space saga too tongue-in-cheek for its own good. Peter Quill (played as a grownup who calls himself Star-Lord by the perpetually smirking Chris Pratt) is abducted from Earth as a boy on the day his mother dies of cancer, frontloading the otherwise goofy goings-on herein with a dose of misplaced mawkishness. Neither of those events took place in Star-Lord's 1974 comic-book origin story. The movie's producers apparently assumed that those changes—as well as other departures from 40 years' worth of Guardians-related Marvel Comics continuity—wouldn't matter to a ticket-buying public that is almost completely unfamiliar with the characters. Fast forward to Quill attempting to procure a mysterious orb from the ruins of an alien planet. He's so unconcerned about possible danger that he slips on headphones so he can listen to music from the Walkman he brought with him when he was snatched from our solar system 26 years earlier. He knows that his foster father and fellow "Ravager" Yondu (a deliciously devilish Michael Rooker) also wants the orb, but you know what they say about honor among thieves. Others interested in obtaining the ridiculously powerful object include the purple uber-villain Thanos (glimpsed briefly during the end credits of "The Avengers"), his lethally ambitious underling Ronan the Accuser (a snarling Lee Pace), his partly cybernetic daughter Nebula (a gorgeously intense Karen Gillan) and his adopted green-skinned assassin daughter Gamora (the not nearly threatening enough Zoe Saldana). Gamora's daddy issues and a crisis of conscience lead her to join forces with Quill and fellow oddball outcasts determined to stop Team Thanos from triumphing. WWE star Dave Bautista is enjoyable as the massive and amusingly literal-minded Drax, who wants revenge for his murdered family. It's the group's two strangest-looking members (and that's saying something) who are its most toy-sellingly charming, however. Feisty gun-toting smartass Rocket, a product of bio-engineering who came out looking like a talking raccoon, is voiced with exuberant relish by Bradley Cooper. His companion Groot is a humanoid tree whose response to nearly everything is the rumbling pronouncement "I am Groot," words that Vin Diesel imaginatively makes meaningful with anything but a wooden delivery. Unfortunately, the screenplay (by director Gunn and Nicole Perlman) turns Quill into the kind of perpetually quipping man-child who can be found littering too many would-be comedies in our end of the galaxy. His worst line? When facing death, he blankly remarks, "There's a little pee comin' out of me right now." And a scene in which Quill compares himself to Kevin Bacon in "Footloose" simply to set up a later gag is so labored it's groanworthy. A recurring device that quickly wears out its welcome is Quill's "Awesome Mix #1" old-school music cassette that supplies 1960s and '70s soundtrack songs by artists ranging from David Bowie to Blue Swede. The tape gives the movie a reason for including a bunch of hoary and sometimes horrid hits (as opposed to far too many other oldies-jukeboxed recent films that make millennials wonder why so much of their grandparents' record collection keeps shambling into the 21st century), but the in-joke doesn't get less annoying with repetition. There's also an obligatory "Star Wars"-style space chase, English (with contemporary slang) is the language of every alien race and obvious plot questions (such as why Quill never used his ship to get back to Earth, or why he didn't stay there if he did) go unanswered. Benicio Del Toro has a bizarre cameo as a shady figure known as The Collector, but appears onscreen only a little longer than his "Thor: The Dark World" end-credits scene lasted. Marvel's attempt to tweak its usual superhero formula by making a cosmic adventure that spends most of its running time winking at the audience has its moments, but it's hard not to wish the movie had taken itself just a little more seriously.